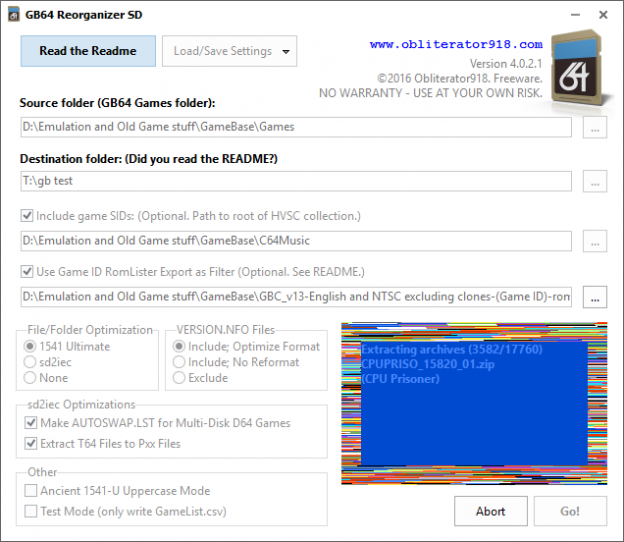 A minor update to Gamebase 64 Reorganizer has been uploaded. The new version is 4.0.2.1. In previous versions, the program would fail to extract the archives if there were 251 or more items in the Z folder. The most archives present in the Z folder up through GB v14 was less than 250, so nobody ever came across this until some recent testing and made me aware of it. It was a simple bugfix. Upgrading to this version is strongly recommended. You can download the new version or read the full changelog here. This entry was posted in GameBase 64 Reorganizer and tagged GameBase 64 Reorganizer SD on September 20, 2016 by Obliterator918.